When it comes to how to best grapple with Arlington’s gloomy economic future, the two contenders for County Board are pitching two decidedly different strategies: one with a look inward, another with a look outward. 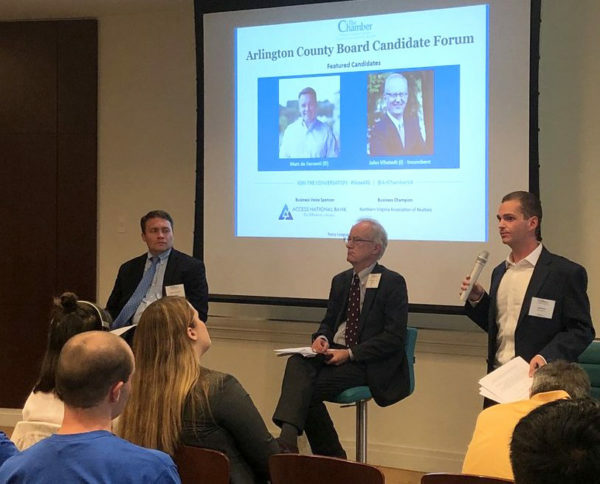 Independent incumbent John Vihstadt spent a Wednesday night candidate forum hosted by the Arlington Chamber of Commerce outlining ways he hopes to change county policies to wring more money from developers and manage growth, and strategies for reforming the county’s permitting processes for new businesses. Democratic nominee Matt de Ferranti, however, dedicated most of his time to discussing his commitment to luring in businesses to reduce the county’s persistently high office vacancy rates, while pursuing tax increases in the meantime. The business-focused debate, moderated by ARLnow, was perhaps best defined by an exchange where Vihstadt emphasized “the cold truth that we can not afford to do everything we might like to do, especially all at once.” The independent has been a sharp critic of some county infrastructure projects since winning a pair of elections to the Board back in 2014, particularly the Long Bridge Park Aquatics Center. De Ferranti says he fully recognizes that Vihstadt’s assessment of the economic challenges ahead are certainly accurate, but he had a “cold truth” of his own to offer. The Democrat reiterated his belief that “we can’t cut our way to prosperity,” pledging to work with the relentlessness of ex-Gov. Terry McAuliffe to attract businesses to Arlington and slash the county’s office vacancy rate to 15 percent over the next four years — it’s hovered around 20 percent for the last several years. But de Ferranti noted that tax increases would have likely have to be part of the equation as well. He worked to make it clear that he’s “not a tax-and-spend liberal,” but also slammed Vihstadt for his decision to vote against soliciting community input on a tax rate hike this year. Yet Vihstadt pointed out that the county just raised taxes last year, including a property tax rate hike that was “the largest in years,” and he felt that the county was better served by taking a “pause” this year. After all, he noted that County Manager Mark Schwartz fully expects to propose tax hikes next year, and perhaps the year after as well. Vihstadt took no firm stance on the possibility of tax increases going forward, but did stress that rate hikes could provide further challenges to seniors looking to remain in the county, a demographic he felt is often overlooked in the debate over affordable housing. But he also pointed out that he believes there’s a better way to secure more cash for government services: extracting more concessions from developers. The county can currently secure transportation improvements or affordable housing commitments from developers — but those changes only come on the site of the properties being developed. Vihstadt would rather see the county require developers kick in money for countywide services, even if the county’s own legal team believes such a move would ultimately be counterproductive. “We have to have some tough discussions about where we’re going to invest to move our economy forward,” de Ferranti said. The Board contenders will square off in several additional forums between now and the Nov. 6 election, including ones hosted by the Yorktown Civic Association on Oct. 1, the Committee of 100 on Oct. 10 and the League of Women Voters on Oct. 25. Progressive Voice: Arlington’s Kodak Moment?